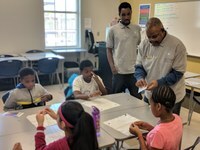 On Friday, April 20, for the third year, NC STEM Alliance hosted a STEM fair for 4th grade students from Elizabeth Traditional Elementary School in collaboration with CPCC Science Department as part of a statewide initiative through the Duke Energy North Carolina Science Festival. The goal of the event was to provide elementary students with hands-on STEM-related experiences and experiments to increase STEM awareness. Approximately 35 CPCC NC STEM Alliance students set-up eight stations of pre-designated STEM activities that reinforced science, physics, math, technology and engineering topics the elementary students were learning in the classroom. The Science Division had five demonstrations that provided students with interactive experiences in Geology, Chemistry, Physics, Anatomy & Physiology, and Biology. They simulated a flood plain, built DNA necklaces, made “elephant toothpaste,” visualized light polarization and performed electromyograms. The Science Fair was enjoyed by children, teachers and parents alike. 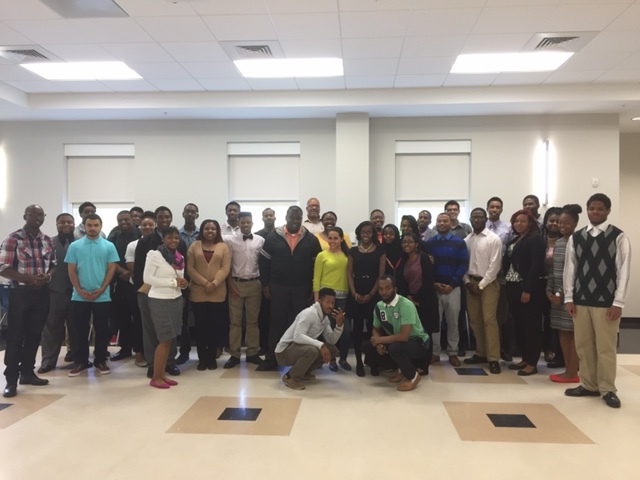 All CPCC students are invited to attend this week’s workshop held by the NC STEM Alliance. The topic this week is: “Soft Skills and Interview Skills.” Come out and receive interviewing advice from professionals working in various STEM fields. You will gain experience and skills to help you stand out in any interview. This workshop will be held on March 22, 2018, from 4-5 p.m., in the Zeiss Building, Room 4112 on Central Campus. Hope to see you there! Great job to all North Carolina STEM Fellows that participated in the North Carolina STEM Alliance Research Day – April 15! A special thank you to all the faculty/staff that assisted the Fellows through their first research experience! Attention STEM students: Are you pursuing an associate degree in a Science, Technology, Engineering, or Math (STEM) program? Find out if you qualify to become a NC STEM Alliance Fellow. For more information or to see if you qualify, visit www.cpcc.edu/ncsa or contact us at ncsa@cpcc.edu. 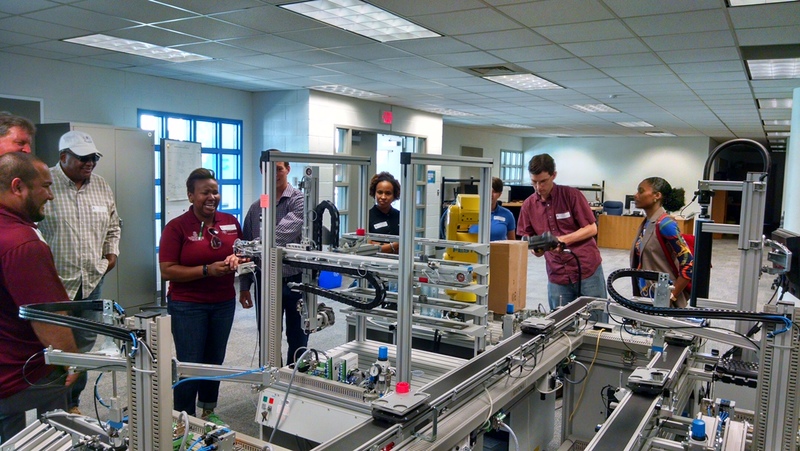 Teachers from Charlotte-Mecklenburg Schools (CMS) are currently engaging in a science, technology, engineering and math (STEM) internship at CPCC, learning how to prepare their students for jobs of the 21st century. CMS teachers kickoff 2015 STEMersion at CPCC. 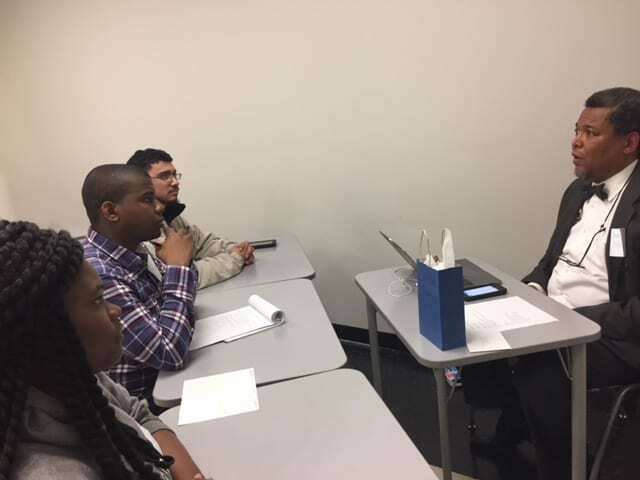 The internship is part of CMS’ STEMersion program, an integrated approach to teaching and learning that applies math and science principals to the solution of real-world problems. For the next two weeks, through August 7, 50 teachers from CMS will participate in STEMersion 2015. The program includes an intensive hands-on learning experience to train the teachers in the skills necessary to complete a variety of high-tech jobs. Following their instruction at CPCC, the teachers will participate in a handful of professional development immersion internships with some of the top STEM businesses and industries in the Charlotte area, including Charlotte Motor Speedway, Bosch Rexroth, Piedmont Natural Gas, LPL_Financial, Skookum, Packard Place, Microsoft, Groninger, Peak10, TIAA-CREF, DAETWYLER, Xerox, Premier. Inc., Siemens, Livingston and Haven, AREVA and Duke Energy. After successfully completing STEMersion 2015, the CMS teachers will create curriculum for use within instructional units across the district in order to better prepare students for today’s workforce. The partnership with the local STEM companies will help teachers understand how STEM comes to life in the workplace so they can create interesting and relevant lesson plans and authentic projects intended to spark student interest and curiosity in these in-demand career fields. – Thursday, March 21; 11 a.m.-noon: “Famous Women in Computer Science/Information Technology,” presented by Ann Aksut, Susan Medlin, Lisa LaCaria, Barbara Neequaye and Jean Schoenheit. The audience will be able to play the game Centipede, co-designed by a woman, on an Atari game system, with IT faculty presenting on various famous women in IT history. Both events will be held in the 2nd floor atrium of the Central Campus Library in the LRC building. In addition, there will be a “Women in Science” exhibit and display during the month of March at the entrance area of the Library. Come join us at the library for the celebration!